The Call-for-Papers from the Nineteenth Century Theatre and Film group at the University of Warwick for the City, Space and Spectacle Conference at their Venice Campus on 8-10 June 2018 in the Palazzo Pesaro-Papafava was just too attractive to be missed. The OBERTO team therefore turned out in full force: Anna Maria Barry, Barbara Eichner, Tim Lloyd and Alexandra Wilson submitted a joint panel about the “Operatic City”, whereas Andrew Holden’s paper on “Rome’s Reception of Religion in Opera 1870-1900” was accepted independently and formed the final presentation in the “Religion and Morality” panel. The conference was dedicated to the memory of Michael Booth, whose ground-breaking book Victorian Spectacular Theatre (1981) ushered in a new era of theatre studies that was less concerned with great playwrights and their works, but instead foregrounded audiences experience, practicalities of staging and the taste for spectacle, particularly in 19th-century London. Many panels were therefore offered enticing topics such as nautical battles on stage, Victorian dancers or the theatrical interpretation of the Whitechapel murders, but there were also presentations about theatrical performances aboard ships and in Napoleonic prisoner-of-war camps, royal ceremonies in Turin and Warsaw, or the famous Hanlon Brothers, an American family of artistes who toured the world exhibitions. Our colleague Michael Burden from Oxford University added “Operatic Cities under Siege” to the theme of staging large-scale catastrophes which pervaded the conference. Our OBERTO panel, amiably chaired by Michael Pisani (Vassar College, US), started with Alex’s interrogation of “Puccini’s Paris: City of the Imagination?”, where she argued that Puccini’s La Bohème built on and in turn contributed to the cliché of Paris as the “city of love”. Barbara compared the cityscapes of Rome and Nuremberg in Richard Wagner’s operas Rienzi and Meistersinger and connected their representation on stage with the expansion of city tourism in the 19th century. Tim Lloyd read the reception of Jules Massenet’s early operas at the Palais Garnier against the contemporary Expositions Universelles, which upped the stakes for visual spectacle on the one hand but also made spectator wary of visual excess in opera on the other. Anna’s paper charted the adventurous travels of tenor Michael Kelly, whose antics off-stage were read through the lens of his operatic roles. Finally, Andrew challenged traditional assumptions about the anti-clerical agenda of late-19th-century Italian opera, with particular attention to the first performance of Tosca in Rome and its reception by Catholics in Rome. This drew unexpected parallels with Leanne Waters’ paper (University College, Dublin) on fin-de-siècle literature and stage adaptations in London, including The Sorrows of Satan. Apart from getting to know many colleagues in theatre studies from the UK, the US and Europe and networking about all things operatic, we also took the opportunity to see some of the sights of Venice, from the Piazza San Marco (at night to avoid the crowds) to the Gothic church of I Frari to the Palazzo Vendramin, where Wagner died – now ironically the municipal Casino of Venice. The city also offered some opera-themed exhibitions: the artworks of Mariano Fortuny in the Palazzo Fontany, including set designs for the Italian premiere of Tristan und Isolde), and an exhibition on the relationship between Eleanora Duse and Arrigo Boito at the Fondazione Cini. Serendipitously, Teatro La Fenice also held a memorial concert during the weekend to conductor Sir Jeffrey Tate. 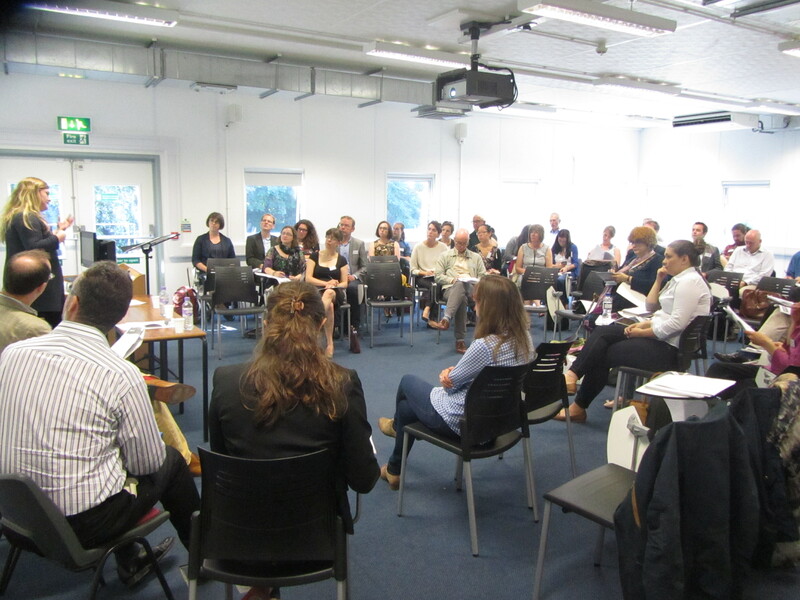 On a sunny day in early September, over fifty delegates travelled to Brookes from the United States, Ireland, Germany, Italy and all over the UK for the fourth OBERTO conference. The aim of this year’s conference was to examine critically the idea of opera as a socially exclusive and intellectually forbidding genre, and to consider ways in which it might be presented in more positive, interesting and productive ways. The stereotype of opera as an ‘elitist’ pursuit for the snooty rich, who dress up to enjoy fat ladies singing loudly in opulent surroundings is not new; however, it is one that has been perpetuated much more vigorously in recent decades by a media hungry for hits and happy to fan the flames of controversy. Concerns about the squandering of public funds are never far from the surface of the debate. The premise of our conference was that the negative stereotypes surrounding opera are profoundly damaging, inhibiting potential new audiences from engaging with opera by telling people it is ‘not for them’. We were delighted to welcome to Brookes not only academics who have approached this issue from a variety of historical and critical perspectives, but also opera house professionals, critics and singers who have to confront the negative stereotypes that are attached to opera in their daily lives. This mixture of different types of delegate led to some extremely productive discussion. A summary of the day’s papers is provided below. For a thoughtful commentary on the conference’s broader conclusions, see Michael Volpe’s blog post here. In the first session of the day (‘Opera and Class’), David Kennerley (University of Oxford) and Paul Rodmell (University of Birmingham) challenged the notion that opera in Britain has always been for an elite. Kennerley discussed a Chartist rally in Bradford in 1841 at which operatic excerpts were performed as a revolutionary call-to-arms, while Rodmell demonstrated that the nineteenth- and early twentieth-century touring opera companies played to socially-mixed audiences up and down the country. Our thoughts turned in the second session to the ways in which opera is marketed: Aoife Ni Drisceoil (NUI Maynooth) debated the pros and cons of opera companies’ use of social media, while Michela Ronzani (Brown University) demonstrated how savvy the Ricordi opera company was at advertising its operas as ‘products’ at the turn of the twentieth century. John Snelson (Royal Opera House) offered a critique of hyperbolic marketing materials that tell audience members how they ‘ought’ to react to opera and, in so doing, set the response bar too high. After lunch, delegates’ thoughts turned to opera’s interactions with contemporary popular culture. Rupert Christiansen (The Telegraph) discussed the rise and institutional mechanics of the ‘crossover’ movement, concluding that the audience for crossover artists is static and that listeners are unlikely to make the leap into attending operas. Hayley Fenn (Harvard), meanwhile, analysed the ostensibly unexpected success of quasi-operatic acts on Britain’s Got Talent. In the subsequent session on international perspectives, Tash Siddiqui (The Wagner Journal) returned to questions of class in her discussion of the Krolloper, an avant-garde opera house set up expressly for the proletariat in Weimar Germany. Turning the focus to the United States, Laurel Zeiss (Baylor University) asked why operas based on actual events (often with a strongly political focus, such as Dead Man Walking) currently make for such good box office. The final formal session of the day was devoted to the role played by education in creating audiences for opera. Andy Doe (King’s College Cambridge) pursued a sceptical line, querying the need for plot summaries and programme notes. In contrast, Michael Volpe (Opera Holland Park) drew upon his own childhood experiences of being introduced to opera and other forms of culture ‘without fanfare’ at an unusually progressive school. Volpe stressed the importance of presenting opera, to children and to adults, as something ordinary, not as something extraordinary. His paper can be read here. Each formal session contained a substantial period of discussion time and there was further general discussion at the end of the day. The conversation ranged widely across many topics: strategies for getting newcomers to attend their first opera; the pros and cons of striving to make opera ‘relevant’; crossover singers being sold as ‘the real deal’; and a hostility towards opera among the political classes, certain sections of the media and even some working in education. Although our conclusions were not entirely gloomy, two things were clear: that there is a great deal of work to be done in changing perceptions of opera; and that we can only do it effectively if opera professionals and academics work together. We very much hope that a publication will result from the conference in due course. In the meantime, Barbara Eichner’s ‘Opera Stereotypes Alphabet’ from the final discussion session will appear here soon. Immediately after attending the RMA Research Students’ Conference (see last OBERTO blog post), I boarded a train for Oxford and the British Society for Eighteenth Century Studies conference at St. Hugh’s College. The theme of this year’s event was ‘Pleasures and Entertainments’; the immense scope of ideas and research which the speakers contributed within this theme was astounding, including everything from the elite women athletes of the long eighteenth century to ‘spiritual alchemy’ and the pleasures which could be gained from writing and hearing sermons. Naturally, opera was a significant form of pleasure-seeking and entertainment in the eighteenth century. Opera, singers, celebrity, theatre design, opera-going and opera criticism in England and abroad were all topics of papers and discussion. The first panel I attended was ‘Opera, Court Cases and Scandal’. Olga A. Baird spoke about the late eighteenth-century composer Antonio Casimir Cartellieri and his ‘mysterious patron “Count Oborsky”’ and their activities in the Habsburg territories. A significant part of this paper concerned Count Michal Kazimierz Oginski, who was a patron of musicians in Vienna. At his palace in Slonim, Belarus, Oginski had his own theatre, a ballet company, and singers for regular opera performances. As a youth Obarsky spent time at the palace at Slonim, and through his association with Oginski he became a ‘pseudo-count’ and patron of musicians and composers, although he remains an enigmatic figure. Oginski’s remarkable theatre at Slonim, however, is evidence of the many places of opera performance based in remote provincial centres, purely for the entertainment of particular aristocratic patrons and their households. After this, Bruce Alan Brown’s ‘Opera in France, Italy, and on the Moon, as Viewed by a Frenchman, Financier, and Philosophe’ examined another mystery – this time the authorship of the Lettresur le Mechanisme de L’Opera Italien (1756). This Lettre makes comparisons between Italian opera buffa and French tragédie lyrique, and questions whether Parisian audiences wanted Italian opera, if they knew why they wanted it, or if perhaps they feared it. The paper touched on the difficulties inherent in interpreting pseudonyms in opera criticism, and deducing whether this Lettre was written by an Italian or French critic. Bruce Alan Brown’s research also provides an alternative perspective on La Querelle des Bouffons, and how debates about operatic styles functioned as a substitute for more direct political debate in 1750s France. Still in the 1750s, but moving over the Channel, Cheryl Duncan illustrated how records of court cases give us a remarkable insight into London’s musical life. The legal disputes between violinist Felice Giardini and John Cox – engraver, publisher, and perhaps also an instrument repairer – demonstrate what varied ‘portfolio’ careers musicians enjoyed or endured during this period. The main operatic link was through Giardini’s involvement with the King’s Theatre. On Thursday morning I took advantage of being at such a diverse interdisciplinary conference by listening to Peter Radford speak about the astounding exploits of elite women athletes during the long eighteenth century, as well as Carolyn D. Williams’s paper on ‘card games and women’s “Intellectual Capacity”’, before attending the Mason Lecture. This year’s lecturer was Dr Jérôme Brillaud, whose ‘Parisian Pleasure Domes: Theatre Architecture and Sensory Pleasures in Eighteenth-Century France’ charted the changing design of French theatres between 1634 and 1784. In the seventeenth century, the examples of the Hôtel du Marais and the Hôtel de Bourgogne demonstrated the rectangular arrangement of these seventeenth-century theatres: sightlines (particularly in the loggia boxes) were compromised, and made the theatrical experience confrontational rather than creating the circular flow of energy which an amphitheatre style would encourage. Not until the late 1740s and 50s did French architects study ancient theatres, and the theorists’ fascination with Greek theatres stimulated a move towards creating theatres in France which would stimulate all the senses. Cochin’s 1765 grand plan for an auditorium with a truncated oval shape, promoting physical comfort for audience and actors alike, was never realised, but his design proved influential. The amphitheatre design improved acoustics and sightlines, democratising – to an extent – the experience of attending the theatre, and provoking changes in acting technique. Brillaud then showed, with a series of exquisite slides, the private theatre of Mademoiselle Guimard (1772), Victor Louis’ theatre at Bordeaux, as well as the new ComédieFrançais. He pointed out that as the external design of theatres became important, their civic significance was consequently enhanced. As a civic monument, the theatre became more politicised, and inside the improved sightlines meant that the entire audience (almost) had a ‘unified sovereign perspective’ in the absence of a ‘royal box’. While Brillaud’s lecture did not extend to the experience of opera audiences, he demonstrated the significance of audience experience, and this is equally relevant to studies of opera-going culture. Ideas about energy flow and communication within the auditorium, and the interaction between audience and performers are also pertinent to opera. Later in the afternoon, after I’d presented my own paper –in a session on ‘Salons, Circles and Polite Societies’ – I had my first experience of chairing a panel: ‘Ballads, Songs and Flute Concertos’. In this session, we were back in the world of London’s pleasure gardens and theatres. In Heike Nasritdinova’s ‘Pleasure and Art: The Vauxhall Songs from John Worgan and T. A. Arne to J.C. Bach’, we saw how the composers of the Vauxhall songs used particular techniques to ensure the popularity of their songs, and integrate pleasure with art, rationalism with entertainment. J. C. Bach also adapted re-used arias from his operas in his songs for Vauxhall. Meanwhile Patricia McCann’s ‘“A much better Ballad-maker, than Play-wright”: A study of Thomas D’Urfey’s song collections’ took us back into the world of the seventeenth-century theatre, and the rich musical world of which D’Urfey was a part. It was bad luck, to an extent, that D’Urfey was a contemporary of Purcell, and his songs have been somewhat eclipsed by Purcell’s, but this paper demonstrated that D’Urfey’s remarkable song collections had a strong following. Heike and Patriciaare PhD students, at Universität Regensburg and Queen’s University Belfast respectively, and so this was an opportunity to form links with more graduate students. I was also glad that I’d been to a conference which was not exclusively musicological, and I hope to attend again in 2015. The Society also has an Annual Postgraduate Conference, which this year will be held in Venice, in association with Ca’ Foscari, University of Venice. The RMA Research Students’ Conference was a great experience. With as many as five parallel sessions at a time, there was a significant number of students and lots of interesting papers on subjects as diverse as music in video games and Egyptian hip-hop. I particularly enjoyed Monday’s session, ‘Music in 18th and 19th Century Britain’, where papers included an examination of the 1842 English production of Semiramide (Catherine Hutchinson) and a discussion of national identity as imagined in the programme notes of the Crystal Palace Concerts (Bruno Bower). These topics were particularly relevant to me, as my research focuses on opera in nineteenth-century Britain, and it was great to meet others working on similar areas. Another particularly interesting session on Monday was ‘Social Analysis – 20th Century England’ where papers included an examination of music publishing during the inter-war period (Kirstie Asmussen) and a fascinating discussion of Holst’s Indian operas (Zara Barlas). On Tuesday I enjoyed the session on ‘Opera’, where OBERTO’s Corrina Connor gave an excellent paper on the figure of Strauss’ Prince Orlofsky and another paper offered a fascinating insight into Shostakovich’s Hamlet (Michelle Assay). My own session was ‘Performance in the 19th Century’ on Tuesday afternoon, where I gave a paper on tenor John Braham, examining how he constructed a British identity. Other papers in this session included a consideration of the politicised reception of prima donna Marie Delna (Emma Higgins) and a discussion of Brodsky’s concert career (Geoff Thomason). My first visit to the RMA Students’ Conference was a great experience – I hope it won’t be my last! Because our interests largely coincide, I found myself at many of the same panels that Anna also attended, and in various ways opera or opera-related papers were prominent in many other sessions. On Wednesday morning in the ‘Analysis – Baroque’ panel, Dionysios Kyropoulous (Cambridge) spoke energetically about ‘Reviving period stagecraft in Baroque opera today’, and drew attention to the fact that in many productions of Baroque operas, the musical aspects (orchestral and vocal) are ‘historically informed’ while the art and rhetorical significance of physical gesture is largely ignored. The next session was the Jerome Roche Prize Lecture, ‘The Turn of the Screw, or: The Gothic Melodrama of Modernism’, given by Christopher Chowrimootoo (who was an OBERTO Early Career Research Fellow last year). His lecture illustrated how Britten’s Turn of the Screw incorporated aspects of gothic melodrama and some of the purer aspects of modernism. I enjoyed especially hearing about the range of critical responses to Britten’s opera after its premiere, and the ways in which critics felt Britten had remained ‘faithful’ to James, or diverged from the source text (to good or disa­strous effect). On Tuesday morning there was a session dedicated to opera, as Anna has described. I was delighted that Charlotte Bentley (Nottingham) was also speaking about operetta in ‘Satire and the status quo: Offenbach’s Grande-Duchesse in Second Empire Paris’. Charlotte emphasised the differences between satire and parody in Parisian operetta, and how the political aspect of operetta functioned as a form of substitute for more open political debate. Opera and politics were also part of Marco Pollaci’s ‘Analyzing Verdi: pedagogic traditions between innovation and politics’. Here we learnt that the Neapolitan system of harmony and counterpoint in which Verdi was educated was so distinctive that Verdi’s use of these pedagogic formulae in his operas were an audibly recognisable political statement. After my own paper, Michelle Assay (Sheffield/Sorbonne) had some useful comments about Russian aristocracy in the early nineteenth century, and their movement throughout Europe. In addition to hearing so many diverse and fascinating papers, another valuable aspect of attending this conference was to see the different ways in which people presented their research. It is very tempting to cram as much into a conference paper as possible, but I found that I learned the most from those papers in which the speaker dealt with just a few points, but in greater detail. I hope to incorporate what I observed into future presentations.